How come Dropbox gets an icon in Finder sidebar? How come Dropbox gets a non-generic icon in Finder's sidebar, when other directories like Google Drive and Sites (native in OS X before Lion) all have the same generic one? How can I customise the icons used by the folders in the sidebar? 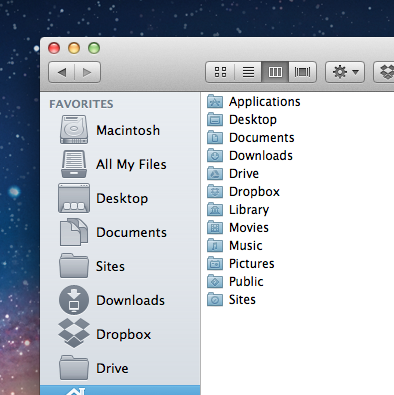 OS X used to show individual icons of all folders there — not any longer. As you've noticed, recent versions of OS X only display generic folder icons in the sidebar. So why does Dropbox get special treatment? The short answer is that Dropbox uses undocumented API to accomplish this. In non-technical speak, it's a special hack that's installed by the Dropbox application. Some curious folks on StackOverflow found the specific mechanism used by Dropbox: good ol' mach_inject. The same bundle provides both the toolbar item and the sidebar icon. Clearly, Dropbox goes to great lengths in order to integrate seamlessly into the Finder. Lacking similar treatment, other ordinary folders have only generic icons in the sidebar. Edit 10/1/2015: As of Yosemite (10.10), there is a new, sanctioned Finder Sync API for integration, as doovers points out in another answer. In El Capitan (10.11), System Integrity Protection will not permit the old mach_inject-style approach. You can also use the extension point’s API to add a toolbar button to the Finder window or a sidebar icon for the monitored folder. Receive notifications when the user starts or stops browsing the content of a monitored folder. For example, the extension receives notification when the user opens a monitored folder in the Finder or in an Open or Save dialog. Turn on "Show Colorful Icons in the SideBar" It is located below a text box of "Max Width"
If you have added a custom folder to the sidebar, you can change it's icon too. Let us say that the folder name is called "Softwares" Prepare an ICNS file with the name SidebarSoftwares.icns in the above mentioned directory. Basically the icns file needs to be named SidebarFoldername.icns where Sidebar Remains constant and you input the relevant foldername. Dropbox uses Finder code injection technique to customize sidebar icon (and add items to right-click menu, and add button to Finder's top bar). And there is no good way to customize sidebar icon since 10.7. In Yosemite Apple added some APIs to be able to customize Finder's right click menu and toolbar item, but I'm not sure about the sidebar. The dropbox installer puts one there and the google drive installer does not. Just drag a folder into the sidebar and it will stick, no installer necessary. I was able to get native Download icon in siderbar for a moved Downloads folder. The process wasn't easy and it's described here: https://github.com/w0lfschild/colorfulSidebar_9/issues/1 It relies on mySIMB and colorfulSidebar. 3 years ago I gave up setting the native Downloads icon. Today I decided to give another chance and eventually it's working. Not the answer you're looking for? Browse other questions tagged finder folders icon dropbox google-drive . How do you customize Lion Finder sidebar icons? How can I get Network drive shortcuts added to the Finder sidebar in Mountain Lion?